While the aurora borealis might be the reason most people put Scandinavia at the top of their list of places to visit, it shouldn’t be. There’s much more to Scandinavia than a multi-colored glow in the sky. Scandinavia encompasses several different countries and although they’re often grouped together, they are all uniquely special. What they do all have in common is wonderful, cultured people who will welcome you to their country with real heart. Fascinating cultures full of myth, mystery and legendary gods some of which you’ll be familiar with and others you may never have heard of. And the real reason you should be going there – the absolutely, breathtaking dramatic landscapes and natural wonders the likes of which you won’t find anywhere else in the world. So if you’re thinking of heading to Scandinavia, what should be on your top ten list of places to visit? The landscapes of the Koli National Park aren’t just stunning, they’re also inspiring. Voted the best hiking area in Finland in 2013, the amazing views from the Koli Hills have ignited the creative juices of many famous artists. The park has over eighty kilometers of hiking routes which wind through centuries old, moss covered forests, past waterfalls and through meadow-like clearings. Take the trail up Ukko-Koli Hill and when you reach the summit, over three hundred and fifty meters above sea level, you’ll be rewarded with the best-known view in all of Finland – the panorama of Lake Pielinen. If you prefer to sit and ponder on the wonders of the world, then climb the hiking route up Paha-Koli Hill. You’ll find Finland’s most famous viewpoint at the top. A large jutting rock where you can rest and contemplate the incredible views of the lake below. Why Go? Koli National Park is the place to get back in touch with nature. It’s totally unspoiled and uncommercialized. If you want to immerse yourself to the full in the Finnish experience, try this Helsinki Koli National Park Four Day Tour. The skiing, cycling, and canoeing come highly recommended as does the fantastic Koli Relax Spa. The Koli National Park has inspired many great creatives when you go, maybe it’ll inspire you too. When man puts his mind to construction the results can often be astounding. The Oresund Underwater Bridge which links Sweden with Denmark is one of those feats. 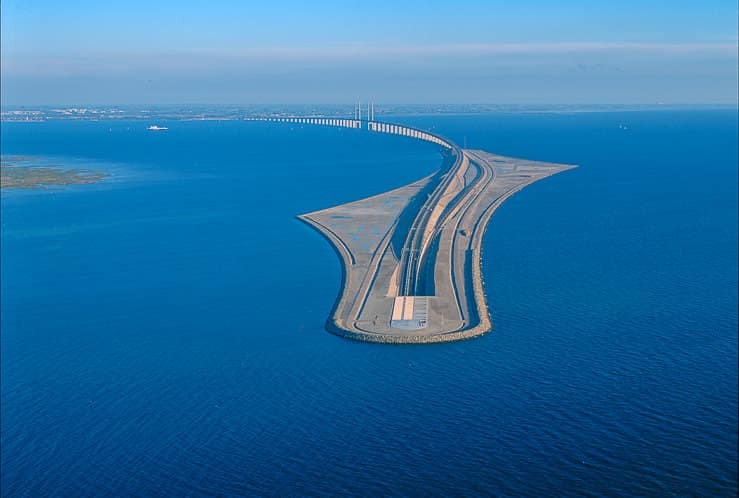 It stretches for almost five miles across the Oresund Strait and is the longest road and railway bridge in the world. Its imposing design, almost as iconic as the Golden Gate Bridge, is visible from the air when you fly into Copenhagen. But that fact is not the one which makes it uniquely special. What does make it special is how the dramatic bridge structure, which starts on the Swedish coast outside of Malmo, suddenly takes a sloping dive and submerges beneath the waters converting into the Drogden tunnel. The two and a half mile long tunnel re-emerges on the Danish island of Amager. Why go? Driving over the Oresund Bridge is a surreal experience. One minute you’re cruising almost two hundred feet above the water the next plunging down to over thirty feet below it. In less than fifteen minutes you can leave Sweden and be in Denmark or vice versa depending where you’re coming from. Definitely a drive everyone should do at least once in their life. Every hike has its end rewards. Some bigger and more spectacular than others. Preikestolen in Norway is one of the latter. At just under a staggering two thousand feet high, the flat-topped cliff looms over the glacial blue waters of the Lysefjord below. The granite plateau can only be reached by a short but steep path which can take anywhere up to three hours to climb. It won’t be the climb which takes your breath away though, it’ll be the views you’re compensated with when you reach the top. Why go? 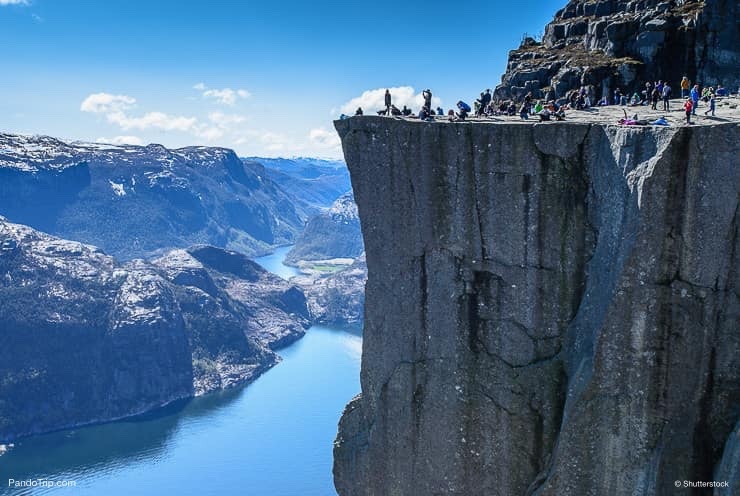 The Preikestolen or Pulpit Rock is one of nature’s unique rock formations and is the most famous viewpoint in Norway. Standing on the edge to get the ultimate photo will bring on a serious adrenaline rush. It’ll make you think twice about how the Base jumpers, who use it as a launch site, feel before they leap into the great void. Don’t feel confident enough to hike it alone, but still want to give it a go? You can take a Guided Hike of Preikestolen which will make it all seem like a walk in the park. If you’ve ever wondered what it might be like to have your own private island, you need to sail around the Stockholm Archipelago. With upward of twenty thousand islands spread throughout the Baltic Sea, your imagination would have plenty to choose from. You might not want to share with the seagull colonies which inhabit some, but there are others which are studded with Viking graves, nature trails to cycle along and there’s some amazing wildlife like eagles and seals to spot. Why go? The Stockholm Archipelago is world renowned for the quality of its food. The islands are peppered with farm shops where you can try and purchase local food stuffs which have been ecologically produced. It’s also the ideal place to practice your kayaking skills too. If you’re worried about navigating round the islands or nervous of not making it back to civilization, then try a Kayaking Adventure with a professional guide. He’ll make sure you get back to Stockholm. If you prefer to feel the wind in the sails rather than doing some strenuous paddling, then try a Stockholm Sailing Tour. You’ll discover what it’s like to captain a yacht through one of the most beautiful places in the world. Only one word for it – amazing. The Löyly Sauna in Finland’s capital city, Helsinki, really is worth getting steamed up about. Although it’s easy enough to get a sauna pretty much anywhere in the country, this one is special and just shouldn’t be missed. 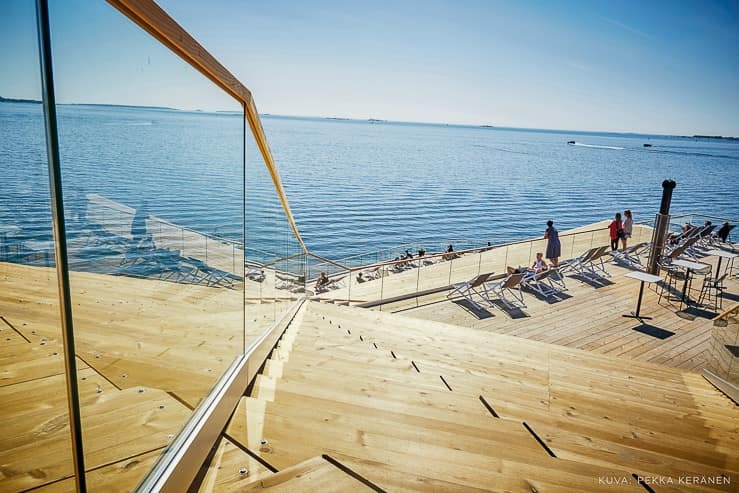 Stunningly stylish, the waterfront installation looks out over the Baltic. 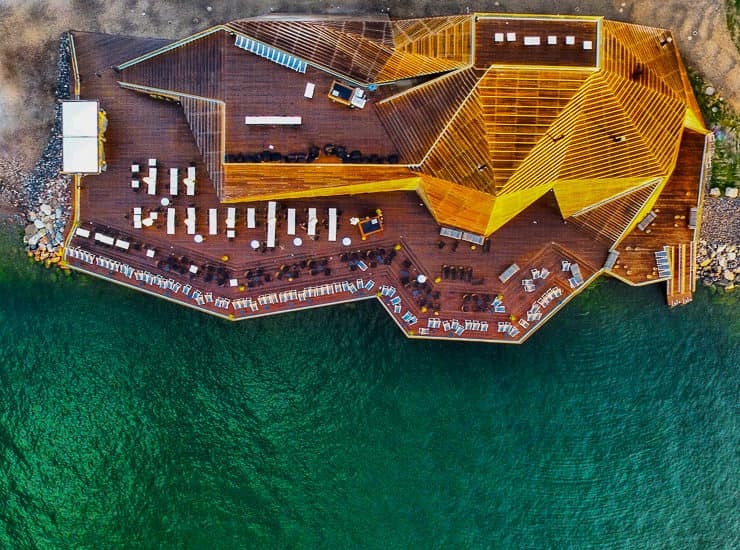 As well as enjoying a traditional smoke sauna followed by a dip in the sea, there’s a very classy restaurant and some great cafe terraces where you can enjoy the views. Why go? If you’re in Finland then you have to try out the sauna culture and there’s no better place to do it than the Löyly Sauna. Communal or private, though going it alone does involve quite an inversion, it’s something you should experience. The bonus, you’ll feel all the better for it and be pink and glowing with health after. If you visit the Råbjerg Mile in Denmark, don’t stand still for too long. 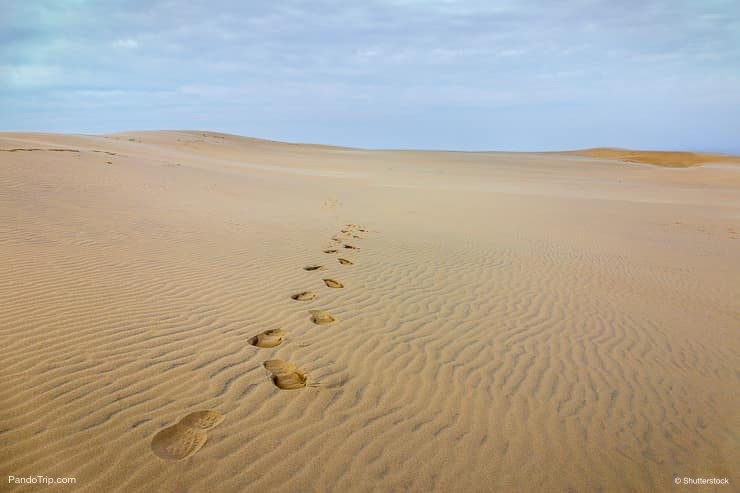 The impressive stretch of sand dunes creep forward at a rate of just under sixty feet a year and engulf everything in their path. Phenomena of nature, the dunes can reach anywhere up to one hundred and thirty feet in height. That’s a lot of sand and the closest thing to a desert you’ll find in Scandinavia. Propelled by the winds which gust through the area, the Råbjerg Mile covers a surface area of just under half a square mile. The Rubjurg Knude Lighthouse is one of the shifting sands latest victims. The high point it once stood on is now covered with sand and although it’s not completely engulfed by the dunes, it won’t be long before it is. Why go? If a visit to the Sahara to photograph the dunes there is out of the question, then you should go here instead. The Råbjerg Mile dune formation is constantly changing from week to week so no two photographs are ever really the same. 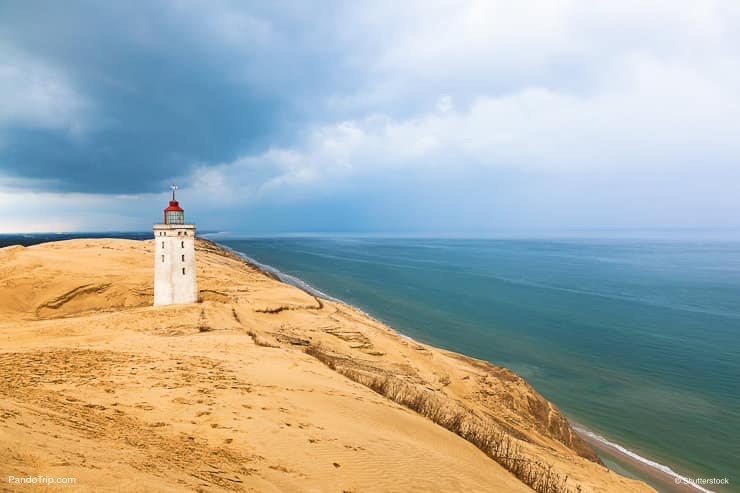 Go there while the Rubjerg Knude Lighthouse is still standing. It won’t be long before the lighthouse succumbs to the pressure of the sands which are encompassing it, collapses under the strain and becomes nothing more than a pile of rubble. If you’re into exciting drives, the Atlantic Road should be right at the top of your list of amazing highways. The Atlantic Road curves its way through an archipelago of islands on the western coast of Norway. The road links the islands together with five miles of switchbacks more twisted than a dragon’s back, eight bridges, and several viaducts. It has been designated the honorable title of Norway’s construction of the century. Why go? If you’ve ever wanted to island hop without getting on either a boat or a plane then the Atlantic Road is for you. It might not be the longest drive in the world, but it is definitely one of the most demanding. It gets even more exciting when the sea is rough and waves crash over the road. There’s plenty of places to stop along the way which include some great viewpoints where you can look back and marvel at what you’ve just driven over. It really is the road trip of a lifetime so don’t miss it. There really is only one place you can go for a perfect chill out stay and that’s the Ice Hotel in the small town of Jukkasjärvi in northern Sweden. The hotel started as one single room in the late eighties. Now there are around seventy deluxe suites constructed every year with ice blocks taken from a nearby river. The igloo-type rooms are decorated with stunning murals and ice statues carved by local sculptors. There’s no worry of anything melting as the temperature in the rooms maintains a steady -5 to -8 degrees. Now that’s cool. Why go? It really is a unique and very special experience to lay back, wrapped up in an army issue sleeping bag and reindeer skin blankets, to watch the cosmic show through the skylight opening of your room. The Ice Hotel’s remoteness, it’s one hundred and twenty odd miles north of the Arctic Circle, means it’s also a place where you can listen to real silence. After you’ve been out on a dog sled ride and before you tuck yourself in for the night, a shot or two of vodka served in an ice glass at the Ice Hotel’s bar is a definite must do. 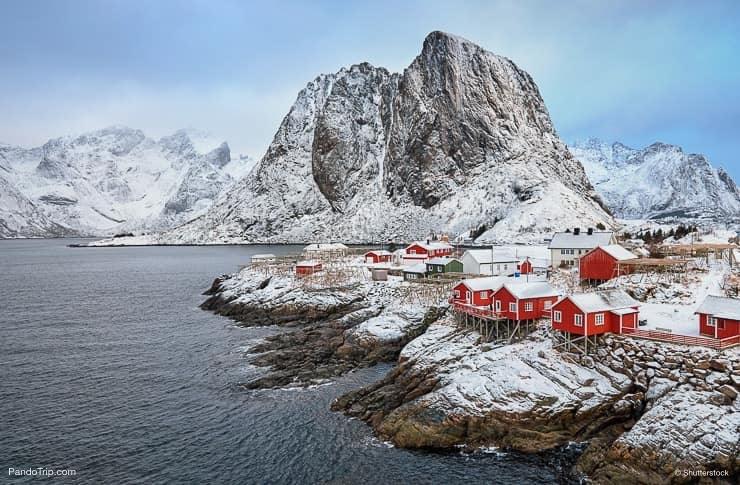 There’s an old saying which goes – where there’s a will there’s a way and you’ll need to be very determined to get to the Lofoten Islands in northwest Norway. It takes the best part of a day, by plane and boat, to get there, but it is well worth it. The isolated islands, which are north of the Arctic Circle, have been blessed with landscapes which look as if they could only have been created by the most imaginative of game designers. Stark and steep mountain peaks back the glacial waters of the fjords which are so clear they reflect the blue of the sky and the colorful, painted fishing huts which line their shores. Add the extra nuance of Arctic light by day or the aurora borealis by night and it’s as if a little piece of heaven has somehow ended up in a remote corner of the earth. Why go? 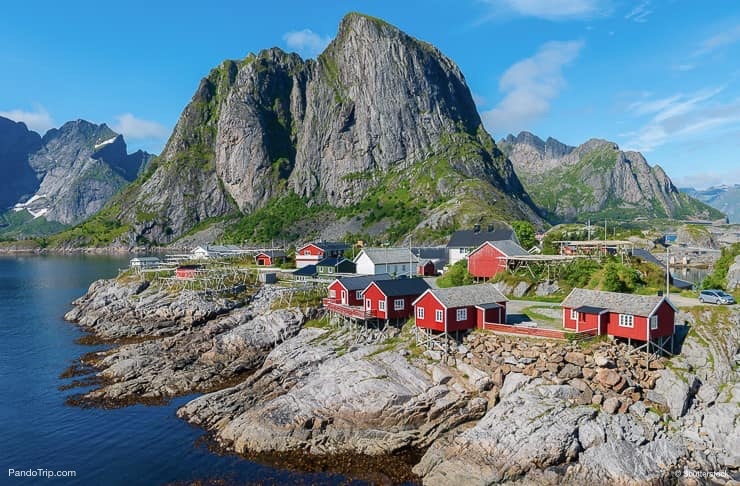 If you love the great outdoors and are the adventurous type, the Lofoten Islands is the ideal place for you. The fjords are perfect for canoeing or kayaking or if you want to explore, hiking over the ruggedness of Austvågøya Island should be on your list. If seeing the world through a camera lens is your thing, you’ll need a guide to show you the best spots for photography because you’ll be far too busy snapping off shots to look where you’re going. Norway is without a doubt a country full of fjords. With an estimated count of around one thousand two hundred, it’d have to be a special one to stand out from all the rest. The Geirangerfjord meets all the criteria to make it Norway’s king of the fjords. Over nine miles long and just under a mile wide it has been designated a UNESCO World Heritage Site. Surrounded by steep cliffs on both sides, the Geirangerfjord is adorned with several very impressive waterfalls and some of the most scenic hiking trails in the world. Why go? If you’re going to see a fjord then make sure it’s this one. The Geirangerfjord really is the one to hike around until you find that certain spot, the jutting rock, where you can sit and get the most epic photograph ever. If you’re not brave enough to hang on the edge of a precipice there’s also some solid fenced observation points where you can stare at the view without worrying you’ll slip over the edge. If hiking just isn’t your thing, but you’d love to go around the fjord then sit back, relax and tour it by bus. Whichever way you see it, you’ll know you’ve seen the best. Has Scandinavia really tempted your travel taste buds? If it has and you’d like to know a little more, the Lonely Planet Scandinavia Travel Guide comes highly recommended. Inside you’ll find lots of tips on how to plan your trip to Scandinavia, even more incredible places to visit while you’re there and some fantastic photos which will keep your travel juices flowing.